An early Mennonite community whose name in German means "rose field,” in 1882 it became a station on the Canadian Pacific Railway line through this region of southern Manitoba. 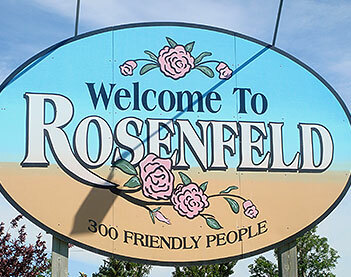 A village in the Municipality of Rhineland, in 1949 it became the Unincorporated Village of Rosenfeld with a council of three persons, elected every three years, and a Secretary-Treasurer appointed by the elected council. When the Manitoba Municipal Act was re-written in 1996, it became a Local Urban District (LUD), which it remains today. 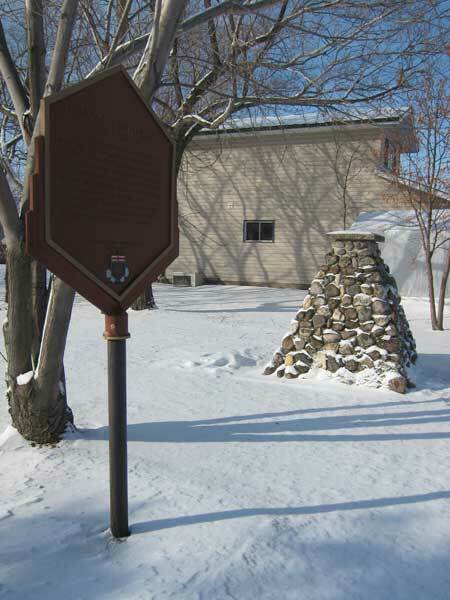 This plaque, erected by the Historic Sites and Monuments Board of Manitoba in the LUD of Rosenfeld in the Municipality, commemorates the Mennonite West Reserve. Established in 1875 by the Canadian federal government, the West Reserve provided agricultural land for immigrants from South Russia. Within a decade, 6,000 people were living on the seventeen townships reserved for their use. Seventy villages were founded and the land was divided into long strips around each village. This proved to be an inefficient system for grain farming and, by 1924, the open field pattern and many villages had been abandoned. Near the plaque is a fieldstone cairn, dedicated on 2 August 1970, commemorating the pioneers of the Rosenfeld area.